On May 19th, 2018 Local Art Teacher Dana Monroe and Community Artist Diana Ryan led a 3 hour workshop at the annual Lincoln Elementary School Carnival. At this workshop community members and Lincoln families were given the opportunity to participate in painting whimsical farm characters on panels that, when finished, will be installed into a Community Mural at a wall facing the Leonard Street Community Garden in South Town. The Mural project is being sponsored by Willamette Housing Services and was approved for a Neighborhood Improvement grant by the city. 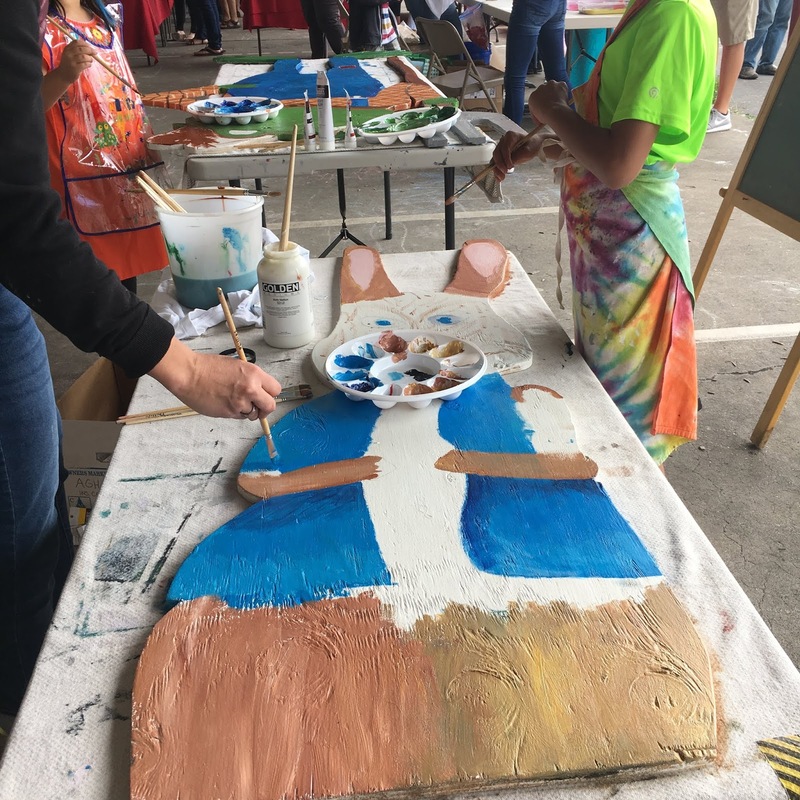 The finished mural will add beauty and intrigue to a low-income neighborhood and will be an attraction for neighbors to extend their walks throughout the neighborhood. The bulk of the mural was painted in 5 days in Mid July, 2018 using 3 tiers of scaffolding to reach the top of this 25 foot high wall. Dana and I met in the mornings and evenings to beat the mid day heat, with our kiddos in tow. We enjoyed connecting with neighbors interested in the project, listening to the hustle and bustle of diverse families and residents, and seeing familiar faces from the local Elementary school playing in the community garden. The finishing touches of the mural were painted in early August as part of the "National Night Out" community event. Local residents and kids had the opportunity to paint flowers in the foreground of the mural as the community came together in the shared space to enjoy food and connect with their community. 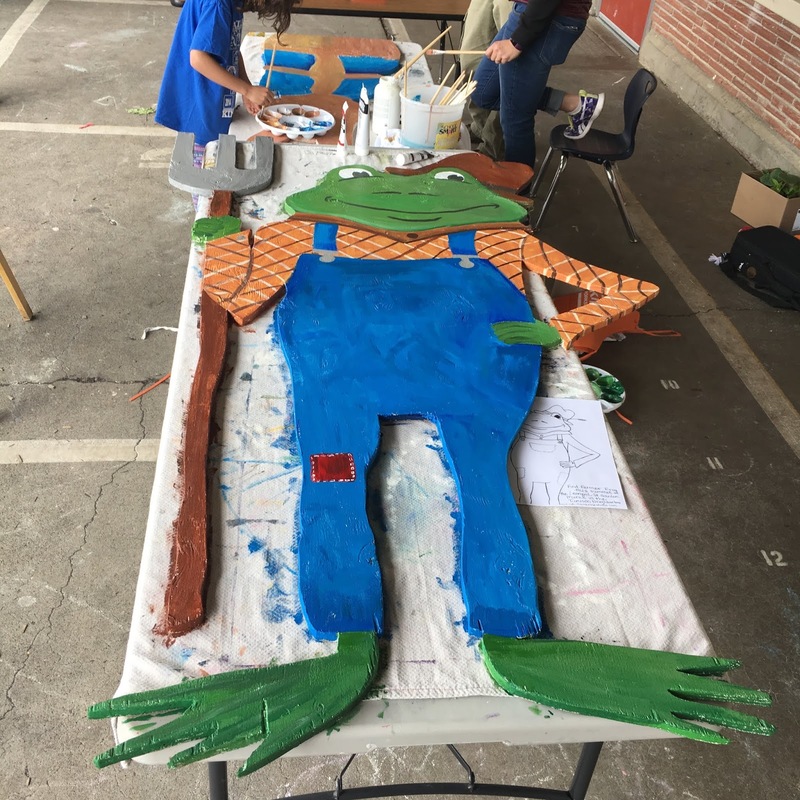 It was a huge success and was included in the local newspaper- Click here to view the article in the Gazette Times about the project. Many thanks to our supporters: the Willamette Neighborhood Housing Services, a city of Corvallis Neighborhood Empowerment Grant and the AARP of Oregon. 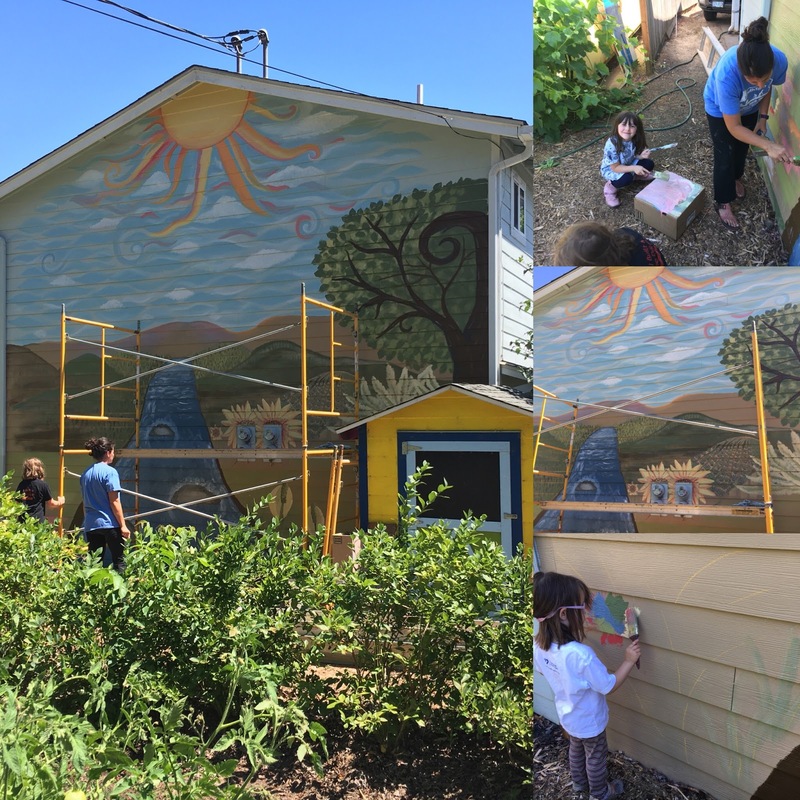 I am thrilled to have had the opportunity to paint the first mural in South Corvallis and look forward to future South Town Mural projects (spoiler alert- the next one is being painted on the side of my art studio)!! Stay tuned! Detail of Finished mural and Gardening Peter Rabbit.